Well Being Journal. 24:4; pp. 16-24; (2015). Trying to “get healthy” can prompt you to order a spinach salad, get a juicer, and start pouring almond milk over your cereal. All these “healthy” actions can eventually add up to major health problems – ones you’d rather avoid. Problems like chronic pain, fatigue, and kidney stones can develop from too much “healthy food”. 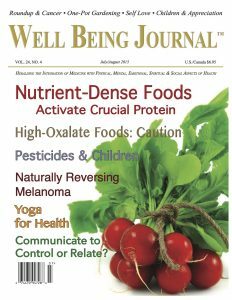 Learn more by getting the free 12-page reprint of my article, When Healthy Isn’t: The Risks of High Oxalate Foods from the 2015 July-August issue of Well Being Journal. You’ll learn to protect yourself from current nutrition fads by learning the science of oxalates. And you’ll want to share this eye-opening information with friends and family.